I would have to say that the first book of the series (in publishing order, not chronological) is my favorite. The main character Lessa was immediately sympathetic to me. It was neat to follow her journey from servant girl in disguise all the way to reclaiming her rightful position as ruler of Ruatha Hold. However, she has to relinquish her position to “impress” the golden dragon Ramoth and travel 400 years (“turns”) back in time to save Pern. 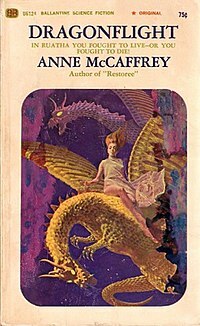 Anne McCaffrey does an excellent job of immersing her readers in the world of Pern and making the fate of the planet and its residents important to us. I always admire writers who can create brand new worlds in such elaborate detail. Time travel and flying dragons and rulers in disguise as servants . . .
For Nero Wolfe, I would have to say The Doorbell Rang, though with so many books it’s difficult to choose. Real World: A journalist wrote a book called The FBI Nobody Knows, exposing considerably abuse of power by the FBI and its director, J. Edgar Hoover. Rex Stout read the book and was so impressed that he used the book in a Nero Wolfe novel. So, a fictional mystery wrapped around a real book. In the novel: A rich woman has purchased 10,000 copies of the FBI Nobody Knows, mailing them to all sorts of prominent people. She comes to Wolfe and says that the FBI is harassing her and spying on her, in retaliation for what she did. Wolfe rejects the case, saying that taking on the FBI is a ridiculous task for a private investigator, and besides, since she read the book, she should have expected this. But she appeals to both Wolfe’s ego and his avarice, offering him a $100,000 retainer, which he will keep whether he succeeds or not. So, he takes the case. Both times when the Wolfe stories have been adapted for TV they’ve started with this one. There’s a reason.